Amazing how different birds look in the early morning light, depending upon which side of the boardwalk they’re on! Well, actually, it depends on whether I am looking toward the sunrise, into the shadows, or if the sun is behind me 😉 I caught sight of this unmistakably-shaped bird, a Purple Gallinule, in the shadows on the “wrong” side of the boardwalk the other morning. I only wished the lighting was better. As I watched him clamber up the narrow stalks of the Fireflag plant to reach the choicest blossoms, I thought about how much better a photo it would be if he were out in the full sun. Purple Gallinules look so much more brilliant when sunlit, as in the featured image on this post. All of a sudden, I heard him fly to the other side of the boardwalk, and hoped I’d catch a glimpse of him on the “sunny” side. As I turned around to look, he reappeared in the water below, showing off his beautiful face so I could take a better picture in the sun. What a cooperative bird~! I love these bird series! The last one is perfect! Surely it won’t rain the whole weekend ;). I’m sure you’ll find a spot for some outdoor time! They do have wonderful color, but my favorite photo is the one climbing the plant. It looks too big for that tightrope walk. 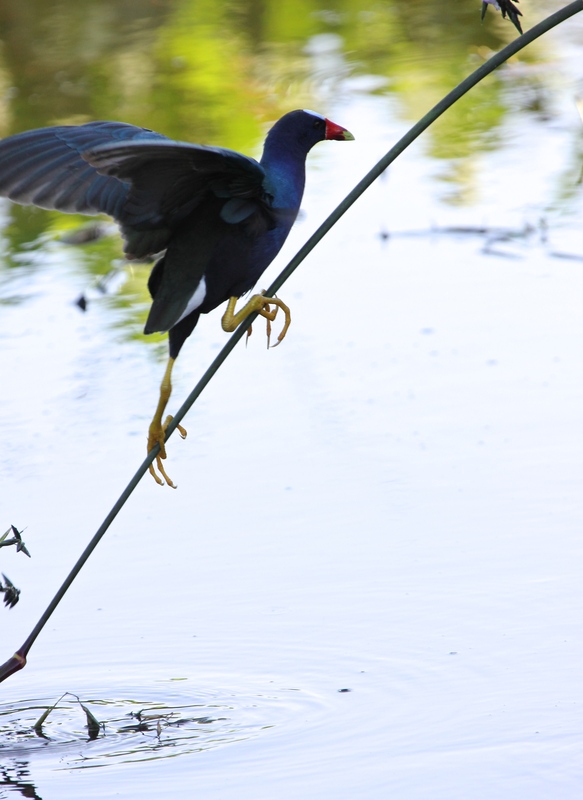 This tightrope walking is my favorite Purple Gallinule behavior to watch! It’s amazing sometimes the lengths they will go to – really “out on a limb” – to get at the topmost, tasty flowers! Thank you, HJ – I appreciate that! Love the colour in the Purple Gallinules, has a slight resemblance to our Purple Swamphen. 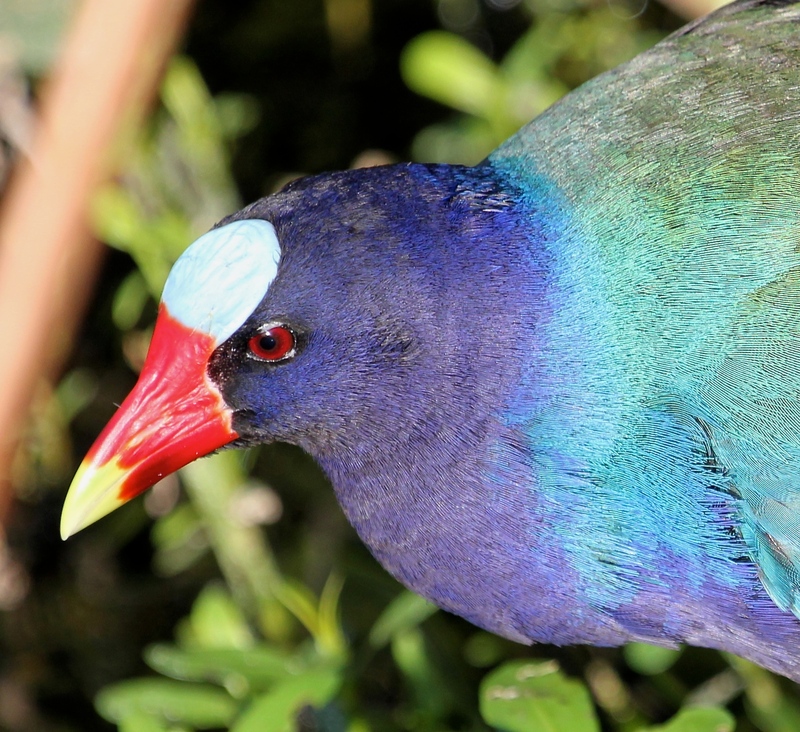 Funny, we also have Purple Swamphens here, non-natives, and people very often mistake them for the Purple Gallinules. I’m not sure where our Swamphens are thought to originate from.. . . have to look that up! How lovely! It is a bit frustrating when they sit right against the sun and you’re not able to look at their colours. This is just magnificent. Yes, and especially when it’s a bird that I know is so pretty in the full sunlight. Thanks for your comments, Sukanya! Terrific shots of this colorful bird, one that I have never had the opportunity to photograph. Well done! I’m sure you will one day – you’re in the right state, I think! We have had a few local sightings but so far I’ve missed it every time. Another bird that seems to have abandoned us lately is the avocet. We used to see some reliably but none for a good year or so now. Such loveliness in color and contrast. Your photos are always so beautiful. Thanks very much – the beauty of the subject matter really makes my day, every day! I’m hoping to get more good shots of this bird now that their favorite flowers are in bloom – and soon they should be nesting and chasing baby Purple Gallinules around!